New findings on Mars suggest a volcanic upheaval in the red planet's history. Exploring new planets is usually the motive of science fiction heroes or videogame protagonists, but that's exactly what NASA is doing with the Curiosity mission on Mars right now. The rover landed on the surface of Mars on August 6th, and quickly got to work snapping photographs and taking samples for the on-board instruments to analyze. Today, NASA released findings from just such a soil sample that provides an insight into the geologic history of Mars. According to the tests, the soil of the Gale Crater is similar to those produced by earthly volcanoes in Hawaii. 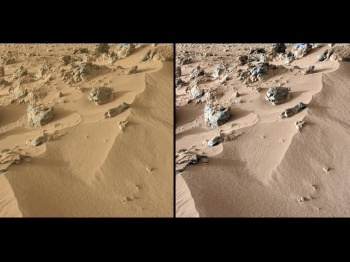 "Much of Mars is covered with dust, and we had an incomplete understanding of its mineralogy," said David Bish, one of the scientists monitoring Curiosity's findings from here on Earth at Indiana University. "We now know it is mineralogically similar to basaltic material, with significant amounts of feldspar, pyroxene and olivine, which was not unexpected. Roughly half the soil is non-crystalline material, such as volcanic glass or products from weathering of the glass." Curiosity has 10 instruments for analyzing the Mars landscape, but the one that discovered the volcanic soil is called CheMin - short for Chemistry and Mineralogy instrument. CheMin shoots x-rays at samples and measures how much the beams refract to determine the properties of metals or other materials in the soil. The Curiosity is the first rover to carry such high-tech instruments to the subject planet itself, allowing scientists to obtain test results very close to real time. The team is excited with the results from Curiosity so far, but they have yet to find the mother lode - that is, proof Mars sustained microbial life. "Our team is elated with these first results from our instrument," said David Blake, from NASA. "They heighten our anticipation for future CheMin analyses in the months and miles ahead for Curiosity." Me too, David. The anticipation is killing me!